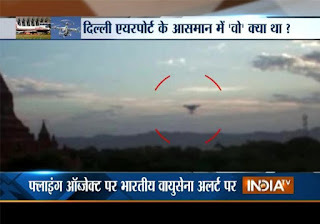 Indira Gandhi International Airport of Delhi has been put on high alert after an unidentified flying object was spotted at the airport. Air Traffic Controllers (ATC) at the airport are regularly spotting suspicious objects flying over the airport which appeared thrice on Friday morning, according to media reports. On Tuesday, ATC noticed a drone like object flying over the runway but it has no visual proof to support its claim. Reportedly, Indian Air Force tried to track down the object by sending a chopper but could not find anything. On Wednesday night, Air Vistara flight from Bhubaneshwar also complained of being distracted by a beam of laser light while it was landing at IGI. Pilot also claimed that the object was 6 nautical miles away from the flight. There were more than 100 lives at risk in that flight. At 10:44 am on Friday, a member of the Indian Air Force who sits at the ATC tower of IGI airport noticed a flying object over runway 9-27, also known as the smallest run way of Delhi airport. He reported two more object at 10:50 am and 10:55 am which were flying outside the airport boundary. But this time also they do not have any evidence. As per the reports, a meeting was conducted between Intelligence Bureau, Central Industrial Security Force (CISF) and Bureau for Civil Aviation Security with Delhi Police so as to ensure the regular watch on such aerial threats. Under Section 144 of CrPC it is prohibited to use fly any object by any individual or a group in areas around the airport.